Australia, New Zealand, Papua New Guinea, Pacific Islands. ECO2000 is proud to be the Australian and Pacific Rim distributor for the UK based ZOK International Group. "Our client network reflects our values of dependability and reliability". Our mission is to be a trusted and reliable supplier of cost effective, environmentally safe, industry best practice products that allow our customers to excel in their business. eco2000 manufacture and distribute cleaning products and tailored applicators specifically formulated for the Aviation, Power Generation, Mining, Industrial and Commercial Cleaning Industries. 1. The ZOK Australia team. 2. 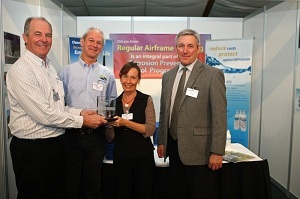 ZOK Australian Distributor receives award for being Silver Sponsors ar RAAA 2011.